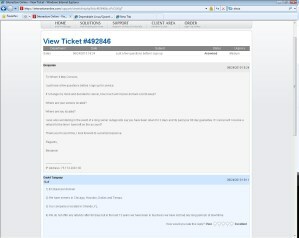 Meanwhile I have put a ticket in with them, to see just how fast they will respond to me. 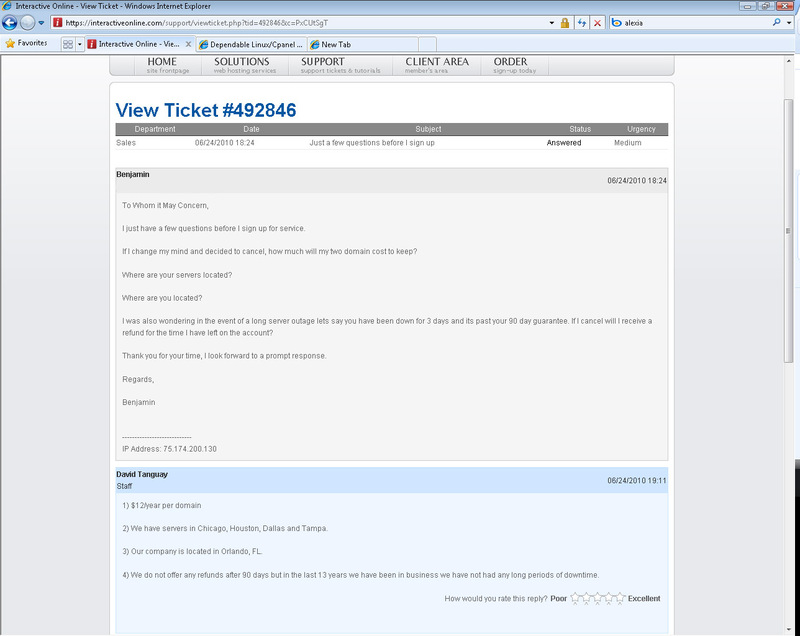 These days I can’t say I am too thrilled with a hosting company that does not offer chat support. In the second part I will cover BeGreenNow.com and their relationship to Interactive Online. I am only skimming here, and I really am not focusing on the whole terms of service. But here is what sticks out as I skim for certain pieces such as uptime guarantee, refund, reasons to have your account shut down…….. Pardon my random approach at this. The first thing that sticks out is “We reserve the right to remove any account without advanced notice for any reason Interactive Online sees fit. “. That’s ….. friendly. Keep in mind this is a unlimited space hosting company. Money back guarantee is only available on our Shared Hosting, cPanel Reseller, Hosted Spam Filter & Exchange Hosting accounts. Setup fees are non-refundable. 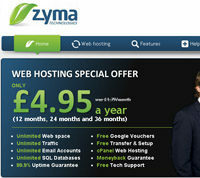 The 90 day money back guarantee is waived on all Special Offers including the free membership to YouJoomla. Please note the special offer of 25% off on their order page, and they charge a $25 setup fee if you sign up for less then 2 years. I am willing to bet they will charge you the setup fee should you cancel prior to 90 days. Backups – While they do back ups, the restoration of those back ups are not free unless of hardware failure. Other wise the cost to restore a back up is $25. I see a lot of hosts that don’t charge for that. Then there is their uptime Guarantee. In the event that there is network outage*, Interactive Online will credit the monthly service charge for the following month’s service as calculated below and as measured 24 hours a day in a calendar month, with the maximum credit not to exceed 25% of the monthly service charge for the affected month. I would advise paying attention to the Service credit and Claim Review Process. In essence you have to put a ticket in to request the credit and you have to document the down time. It may take 10 days for them to accept or reject your claim. 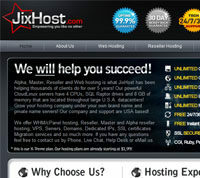 If your account with your old hosting provider does not use the cPanel control panel there will be additional fees. If a customer’s site is hacked, spammed from or there is any other reason why the server gets listed on an RBL, the customer will be responsible for all fees and fines related to getting removed from the RBLs. 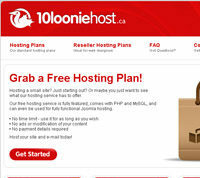 Customer will be billed $100 for every RBL the server is listed on. If the customer refuses to upgrade the scripts to the newest stable version we will upgrade the script for them and charge a $25 upgrade fee. Interactive Online is not responsible for any problems the upgrade may cause. 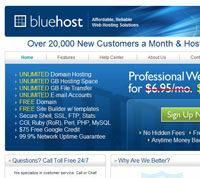 My first thought of signing up with webhosting company for an affiliate program is not to. You might wonder why. Looking through the list I see PayPal.com, Interactiveonline.com gets a referral fee from PayPal if you sign up under their link. I would just go to PayPal.com directly and sign up for their system. As much as I hate to say it, PayPal is a must for business. Too many people trust them over handing out their credit cards to people. The same is true for every merchant account they get set up, and they may very well get a cut of all your sales. I first learned about this from a company called Total Merchant when they tried to get me to refer my customers to their service. It was not til I started receiving checks that I learned I was not just getting a referral fee I was getting a portion of their sales, which I am not really all that fond of the idea. I soon realized that the company that refereed me was getting a cut of my transactions. I wish I would have learned this 5 years earlier. I soon realized it was a good idea to shop around for a merchant account every year, and even pit merchants against each other. Not to mention pit the merchant I was with to compete with them for a better offer. Sometimes the current merchant will give you a better deal if they see the other offers. Even still when they made an offer that claimed to be better then my previous offer I had to read the terms of service to make sure they were not compensating someway with a new fee. These days it is easy to find a merchant (well easy if your in the United States), then when I first started 11 years ago. For that matter I got better at figuring out what a good service was and the last 5 merchant accounts I signed up had no set up fees. No middle man between me and the merchant service. 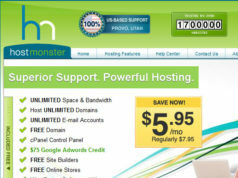 Which is why I would advise avoiding Interactiveonline.com for merchant service if you decided to take them up on hosting I had a friend that was burned by Homestead and went from a $19 a month account to over $120 a month. I recommend contacting your bank about merchant account, as opposed to your host. Especially looking at the some of the set-up fees here ranging from free to $949. Clearly you want to make every penny you get from your customers count, and there is no point in giving your webhost a cut of your credit card transactions. 6% reoccurring fee on other services. 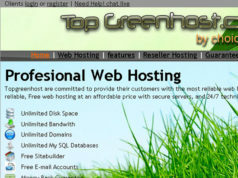 They have lots of wonderful “green” webhosting banners for you to use. No secondary affiliate program that I can find at the moment. Affiliate commissions will not be paid for accounts that are canceled within 90 days. Affiliate revenue will not be paid until referred customer has been an activated customer for at least 90 days. Referred customers must be active, in good standing and all past due invoices paid in order for affiliate to collection commissions on the referred account. If an account the affiliate referred used a promo code, the affiliate commission will be discounted by the same percentage or fixed amount. If the offer is a savings percentage , then the affiliate commission will be discounted for the same percentage. If it is a fixed amount savings the commission will be discount for the fixed amount. Use promo code SAVE25 to save 25% on any billing cycle. Offer good for new accounts & first billing cycle only. So instead of $90 the affiliate would get $67.50 that is $22.50 less. It took them 47 minutes to send me a response. Timing wise its not too bad, but this is a sales question and other companies that provide chat and phone sales support are going to beat them to the sell. One of the things I would give my techs grief for if they had done this ticket is not greeting the customer, and not closing with a signature. I felt it was that you had to make the customer feel welcome. Especially during the holiday season I would have everyone use something along the lines of wishing you the best in this holiday season. I wanted my techs to look like human beings and not robots. With this, I feel like I got a response from a robot. No hello or anything here. Or acknowledgement of my name. For that matter my business partner would have sales staff give out information to entice people in, such as good reasons to sign up for service. As you can tell from my writings I am not a sales person. I am not sure I buy that they have been around for 13 years, or had any long periods of down time. Perhaps they have been around that long. I tend to doubt it as the only package I see are unlimited accounts. I have to wonder if they were around for the last 13 years what were the packages they offered before. When I first saw the name of this company I thought I had a short review, considering search engine results are not the best for “interactive online”, the words can apply to a lot of things like games and virtual tours. But a little digging into the site and I find an overwhelming amount of detail. Anyone that reads the terms of service would pause before ordering. The cost of having to pay for repairs from a hacking attempt regardless if it was the customers fault or not would defiantly make me avoid the host. In my next post I uncover claim to claim to be a green host is overboard. Details on their green program are limited at best as they have a certificate for 8 metric tons of carbon and something in their terms of service about buying one tree per customer. Looking at my email it cost them $112. There is no listing of how many trees have been planted. Frankly based off what I found I find it hard to trust this company. 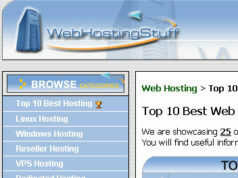 Next articleIs Interactiveonline.com a green host, perhaps begreennow.com helps out!! !